Meet The Firecracker Burger. It is the latest addition to our endlessly delicious Fancy Burger roster. What makes the Firecracker so great? 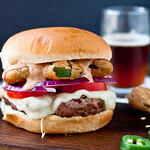 It’s based on the Crispy Jalapeno Burger from BJs Restaurant & Brewhouse. 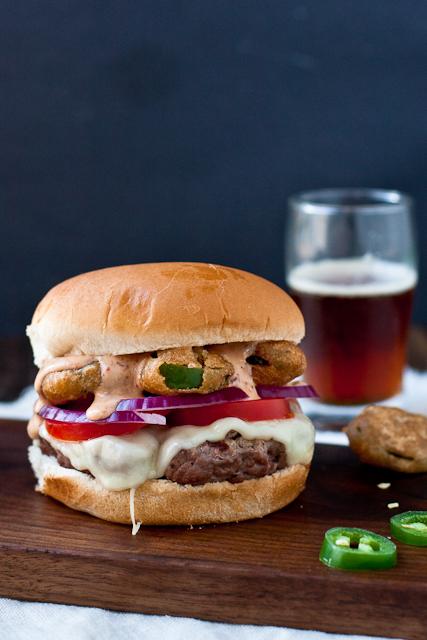 The “crispy jalapeno” part of our burger comes from the beer-battered jalapenos slices I shared with y’all last week. Those delicious bites of deep-fried napalm are then doused with some cool chipotle ranch dressing. Add some crispy red onions, juicy tomato slices, and a slice of melty Monterrey Jack? It’ll be the best burger you have all week. Guaranteed. A juicy burger topped with spicy, beer-battered jalapeno slices and chipotle ranch dressing. Season both sides of each burger patty with salt, pepper and a dash of Worcestershire. Grill 4-5 minutes on each side, topping with a slice of cheese for the last minute of cooking. 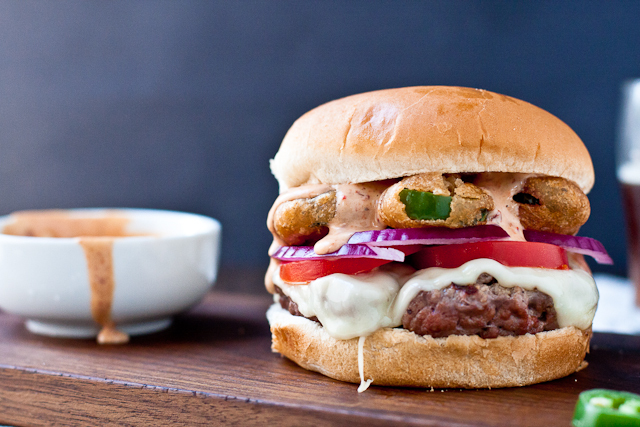 Build the burgers, topping with sliced tomatoes, red onions, ~5 fried jalapeno slices, and a generous spoonful of chipotle ranch dressing. This looks so delicious! I can’t wait to try to make my own! Great recipe! Wow! I’d love someone to make this burger for me. I’m getting hungry just looking at it! Just WOW. This burger looks like just the thing to break me out of my salad for dinner funk! Love the ingredients in this burger…amazing!! Oooh, the husband would love this one! I KNEW you would have an awesome used for those fried jalapenos!! Other than just eating them, which is probably as creative as I would have gotten! This looks so awesome!!! YUM! This looks amazing. Totally addicted to burgers, since getting the charcoal grill!